I don’t know about you, but I absolutely love date nights with my sweet boyfriend, David. Typically, we only see each other during the weekends, so I really cherish every moment we have together. I think date nights are so important! It allows you one-on-one time to reconnect with your significant other. I find date nights so refreshing, too! The thing is, date nights can be expensive and well, money is super tight for us right now. With a super strict budget, that doesn’t mean that date nights can’t happen, it just means that we’ve learned to get creative and change how we do our date nights. Going out on the town is always fun, but sometimes, date nights just need to be in the comfort of your own home! Who doesn’t enjoy a night in and saving a little bit of money? 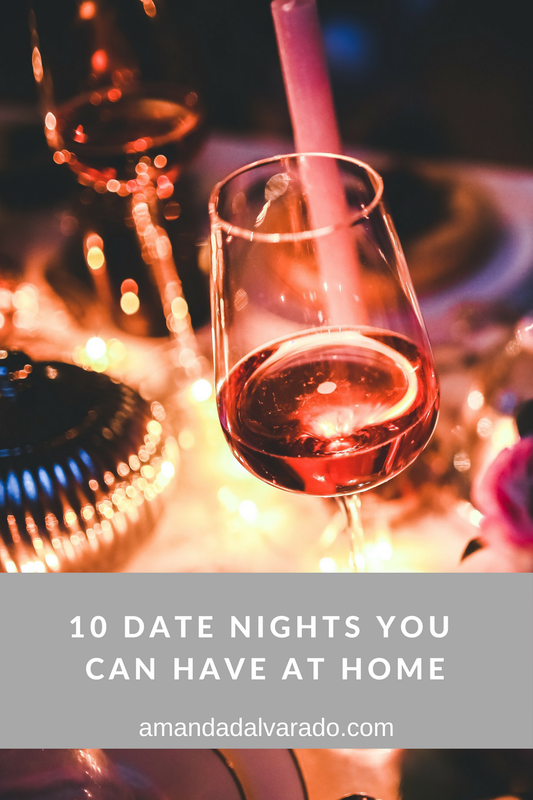 Try to stay home on your next date night with one of these ten date night ideas you can do from home! This is when Pinterest just might be your best friend! Head to the store and get whatever meal you're craving and maybe a good bottle of wine and just have fun in the kitchen. Dress up and set the table really nice. Put on some music to really set the mood. Enjoy each other's company over the delicious meal you just cooked together! Pick a movie to watch and then have a meal based on the movie. This is really fun! Maybe the movie takes place in New York, so you decide to make NY-style pizza. Just be creative and have with this! Yes, take your movie night outdoors! This is where it really enhances the experience to have a projector. If you don't have one, you can always just use your laptop. Bring the wine bar to your house! Grab the ingredients to make a super fancy charcuterie board and some of your favorite wine. 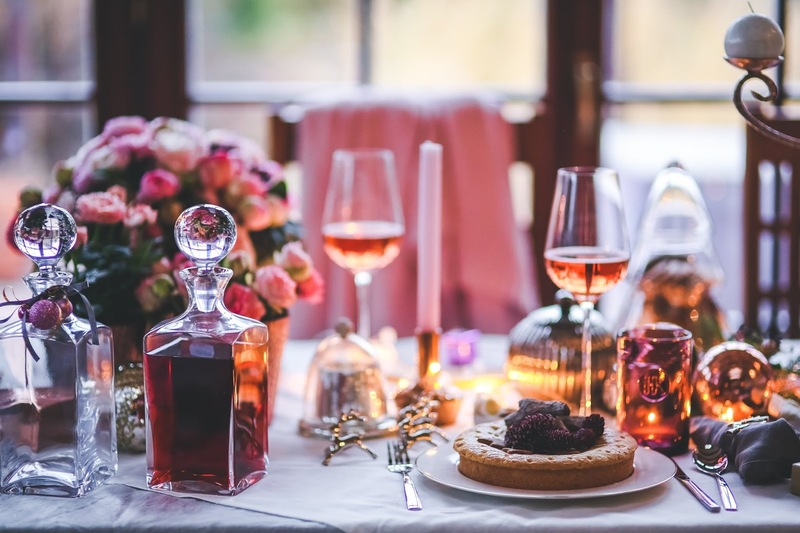 Pick a good spot around the house to have your tasting party and enjoy some good conversation! Youtube is your BFF here! Pick a fun workout video and do it together. Been craving a dessert? Make it from scratch together. Baking is so much fun, especially when you have someone to help you out. Not sure what to make? Just do a Google or Pinterest search! Share your goals with each other! You can make individual vision boards and talk about your individual goals or make one together with some goals you want to accomplish together. This is a great way to not only be creative, but also get focused on your goals in your life. Play a game that involves questions! Think 100 questions or the newlywed game. No matter how long you've been together, I'm sure you'll find out something about your significant other that you didn't know before. Pull out your camera or your iPhone, sit down on the couch, and tell your story. Talk about how you met, future plans, your favorite things about each other. Share your proposal and wedding story! Your children and grandchildren will probably love it one day! Lounge by the pool with some cool drinks! If you don't have a pool, go back to your childhood and pull out a sprinkler or something! Just enjoy being outside. Date nights are so great and such a fun part of a relationships. Dates provide the opportunity to get to know each other on a deeper level and just focus on one another. What was one of your favorite dates you ever went on? Share it with us in a comment! My favorite date was probably the very first date that David and I ever went on. I didn't know it was a real date! I thought we were seeing a movie with friends, but nope! It was just us. Haha. It was such a sweet date though. I was just 16. Sweet, young love! Before I go, thanks for all your support!